Fisherman's Bend by Linda Greenlaw, a Mysterious Review. 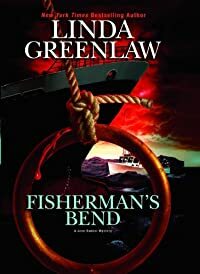 Review: Marine insurance investigator, and assistant deputy sheriff of coastal Knox County, Jane Bunker looks into the mysterious disappearance of a lobsterman whose abandoned boat was found motoring in a circle at sea in Fisherman's Bend, the second mystery in this series by Linda Greenlaw, an experienced commercial fisherman in her own right. When Jane and the captain of her sea transport discover a well-supplied lobster boat drifting at sea with no one aboard, they immediately call for a Coast Guard search and rescue. Before the Coast Guard arrives, however, a small flotilla of lobster boats arrives to retrieve the traps set by the abandoned boat, relatives of the missing captain. They seem strangely unconcerned about his disappearance, assuming the worst and that life goes on. The rescue operation soon becomes a recovery one and Jane takes responsibility for locating the body. But what begins as a relatively simple assignment gets far more complicated when a man is found murdered. By almost any definition, Fisherman's Bend is a cozy (though to be fair, there's nary a cat to be seen or heard from, something for which many readers will be grateful) but the author's fresh take on the heroine, setting, and even storyline elevates it to something more and arguably better. Jane's world can be divided into land-based and sea-based, and it's clear she's more comfortable at sea. The land-based characters are quirky in a cozy sort of way while the sea-based characters have a depth and complexity that make them intriguing. The plot is a simple one but well executed with clues to the mystery of the missing captain abundantly available yet masked by a series of plot twists that are both unexpected and welcomed. Readers who look forward to a long, drawn out denouement will be disappointed, though; the author wraps everything up very quickly in a thrifty, spare manner (another aspect of the book that many readers will appreciate). With titles based on knots, future books in this series are worth looking forward to. Acknowledgment: Authors on the Web provided an ARC of Fisherman's Bend for this review.